Preheat the oven to 350. In a medium bowl, beat together brown sugar and peanut butter with a wooden spoon. Beat in 1 egg at a time, mixing well after each addition. Mix in peanut flour, peanuts, baking soda, vanilla and salt. Roll dough into 1½-inch balls. Place balls two inches apart on a cookie or baking sheet lined with parchment paper or foil. 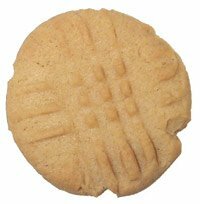 Use a fork to make criss-cross marks on tops of cookies and to flatten to about ½-inch thickness. Optional add-ins: If desired, stir ½ cup semisweet or bittersweet chocolate chips, and/or golden raisins or dried cranberries into the dough.